Vijay's action thriller Theri, directed by Atlee, has already being declared a blockbuster and now it has joined the 100 Cr club. The film is rocking the screens and fans are already celebrating the new avatar of Vijay. A success party was also hosted by Vijay and Atlee recently to celebrate the moment. The buzz is that this successful movie had minted the box office collection around Rs 102.4 crore in just 6 days of its release. This news has been confirmed from the production house. In its first weekend, "Theri" has collected $643,353 (Rs. 4.28 crore) in the U.S. and $279,435 (Rs. 1.45 crore) from Canada. The movie has become the biggest hit of Vijay's career in the North American region until now. The next big overseas centre for "Theri" is Malaysia where the Tamil movie has earned MYR 3,023,041 (Rs. 5.15 crore). It has done exceptionally well in the U.K. as well collecting £280,696 (Rs. 2.67 crore). In Australia, "Theri" has registered an all-time highest opening for a Tamil movie until now by surpassing the collection of Vikram's "I," which had collected $247,751 (Rs. 1.27 crore). 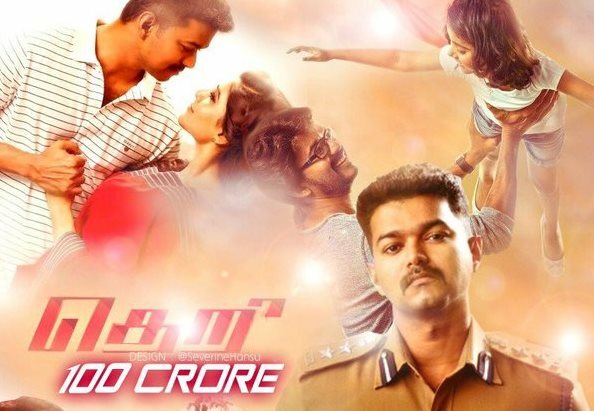 "Theri" has minted A$305,807 (Rs. 1.56 crore) in its opening weekend here. From the New Zealand box office, Vijay's flick has raked in NZ$18,807 (Rs 8.68 lakh). "Theri" has earned $24,857 (Rs. 16.52 lakh) in Norway and has collected €202,005 (Rs. 1.52 crore) in France. From other parts of the world, the Tamil movie has minted Rs. 13.97 crore. Theri is an action entertainer with Samantha and Amy as the leading ladies. Produced by Thanu, GV Prakash's songs are another highlight of the film. Hon. Vijay (not just Ilaiya thalapathy, but also family values thalapathy); He is the most decent & down to earth human being with strong hardworking ethics. GOOD ROLE MODEL FOR TAMILIAN YOUNGSTERS TO FOLLOW. Also, Hon. Ajith, Hon. Suriya, Hon.Jeyam Ravi, Hon.Vikram,Hon.Vickram Prabhu,Hon. Kathi and so on who are REAL TAMILIANS WITH GOOD FAMILY VALUES.